A cartridge system was needed for quick reloads when the RFID tags were used up. A low profile motor drive system and spool system ensured the proper tension and positioning. 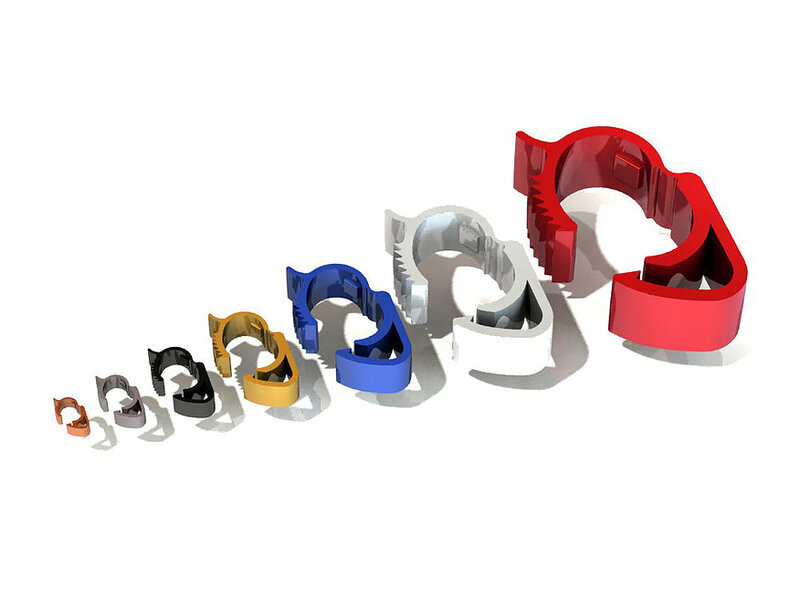 We designed these plastic clips so they could clamp and release numerous times. If the relative dimensions are maintained virtually any size works. The CAD model we developed can scale the design with just a single variable change. By using 3D printer’s small quantities of any size is possible without tooling. This means that a customer can request a custom sized part and have it designed, built and delivered within hours or days. This LED light attaches directly to city power lines and can draw energy from the electrical field surrounding them. It installs in minutes, anywhere on the line thereby eliminating the need for a transformer. 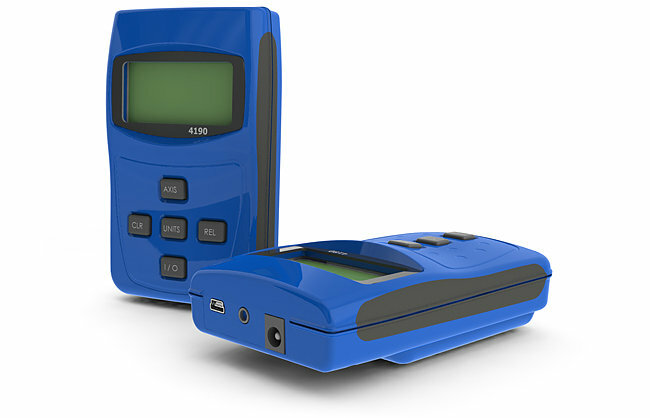 Both 3 and 5 button models of this hand-held meter were produced using a single insert mold, allowing our client to cut tooling costs. 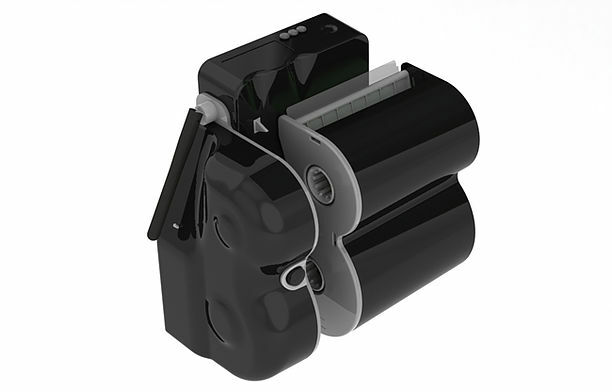 This product boasts elastomeric sealed keypads, sealed LCD displays, custom battery contacts and over-molded hand grips to ensure this product met user expectations in any environment. Moving bodies of water such as canals and streams can generate tremendous amounts of electrical energy. 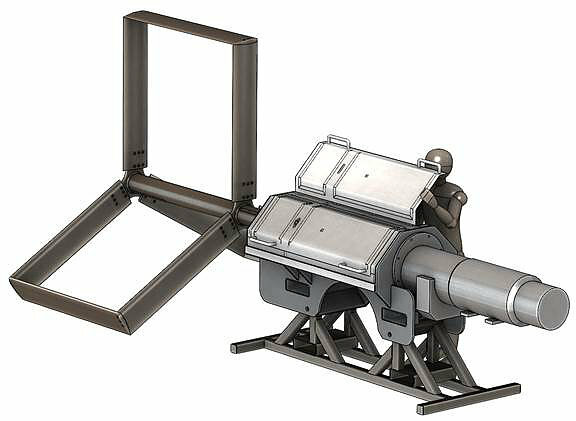 We designed this vertical turbine in partnership with British Aerospace. How do you dissipate up to 29 watts at full duty cycle? Using thermal simulation software and multiple phase changing heat pipes we were able to produce an elegant case that looks as good as it functions. 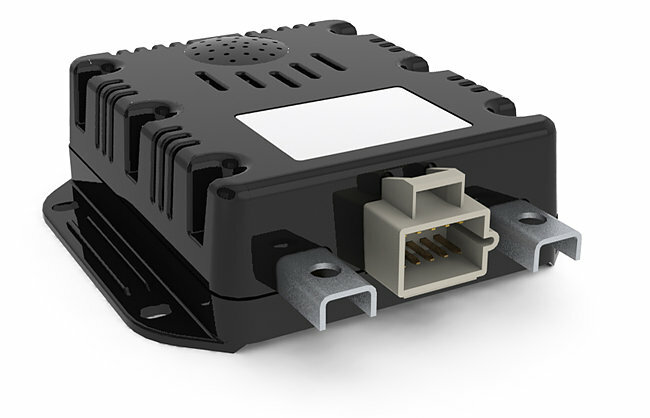 This high performance power management device needed a mechanical design that could withstand the toughest of conditions during its service life underneath vehicles ranging from semi-trucks to LAVs (light armored vehicles). 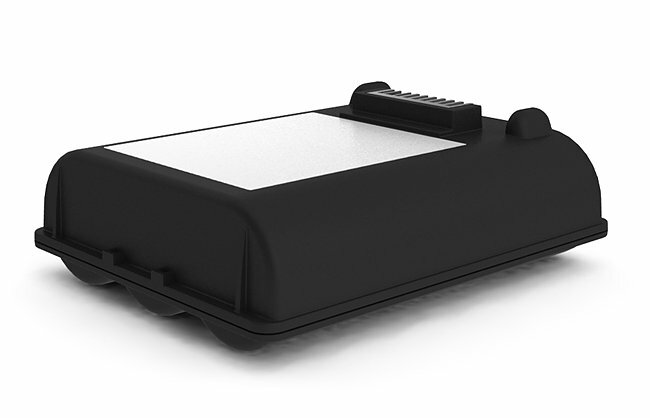 To meet these performance criteria, designPORT created an enclosure and electro-mechanical interface that provided adequate ventilation while meeting both SAE chemical resistance and MILSTD-810 environmental standards. Hazardous environments necessitate special design considerations. This battery pack needed to be designed to MIL-STD-810F. The result was a sealed, ultrasonically welded and flame retardant battery pack that passed with flying colors. To address multiple markets within the automotive industry, our client needed these large injection molded parts to accept numerous display configurations. By methodically designing the internal features for optimal mold-ability and versatility, designPORT was able to decrease tooling costs and increase tolerance control despite the part size, all the while allowing for an array of different displays and graphics. We design the world’s largest snow melting machines including this 42,000,000 BTU monster. 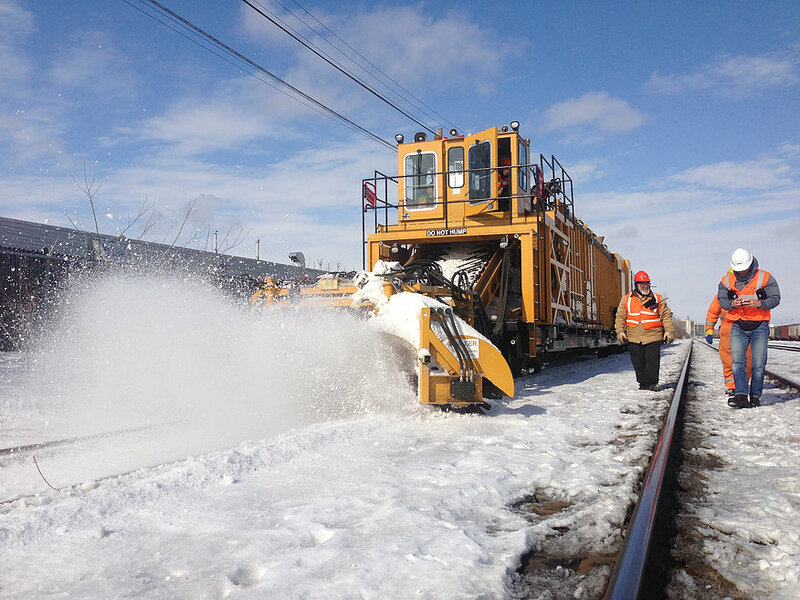 Two operators handle independent “sweepers” to gather the snow from either side of the track. To ensure this meter was intuitive to use we create large numbers of possible layouts for the buttons, displays and connection points. The layouts were put in front of customers to comment and critique before the winner was determined. We designed a concrete block system that provided alignment features that reduces the expertise needed by the installation teams. The lighter weight blocks can be moved and shipped more easily reducing installation time and cost. Integrated insulation and plumbing/ wiring channels speed overall construction project time and accuracy. 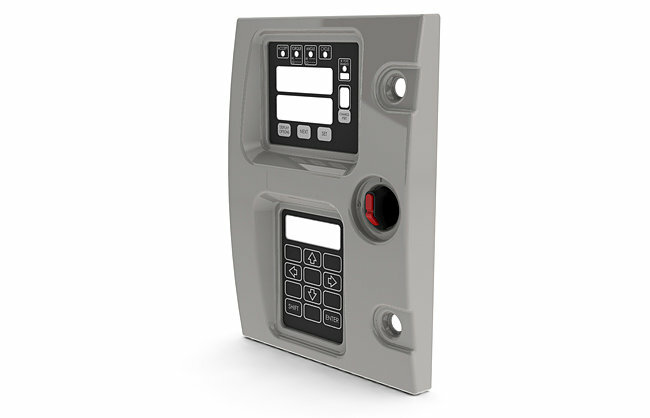 Being able to remotely grant PIN codes and turn off security and fire alarms without a hard wired system saves time and money. 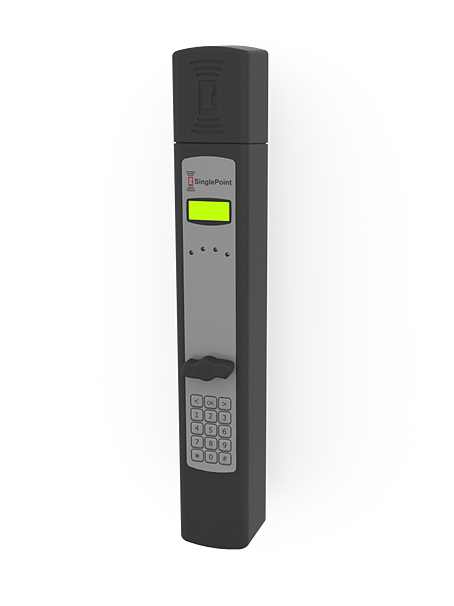 This attack resistant enclosure dispenses keys and keeps track of who is coming and going. Converting a pump action model 870 shotgun into a .50 caliber rifle is no small feat. We developed a conversion kit with a triple lug bolt to withstand the 14,000 psi pressure. 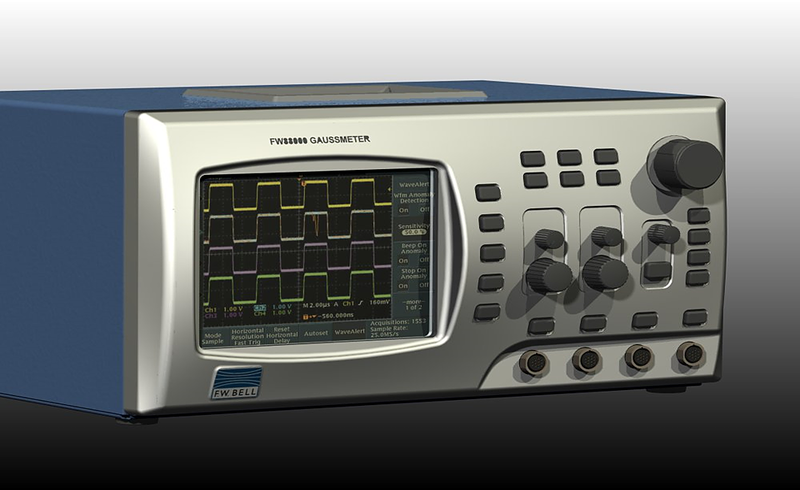 One of the challenges in developing a high performance spectrum analyzer is in how to dissipate up to 29 watts at full duty cycle. Using thermal simulation software and multiple phase changing heat pipes we were able to produce an elegant case that looks as good as it functions. These 3D Glasses need to be washed in an industrial dish washer between each customer use. To ensure the delicate circuitry and battery compartments are sealed we designed and built these testers for our client. 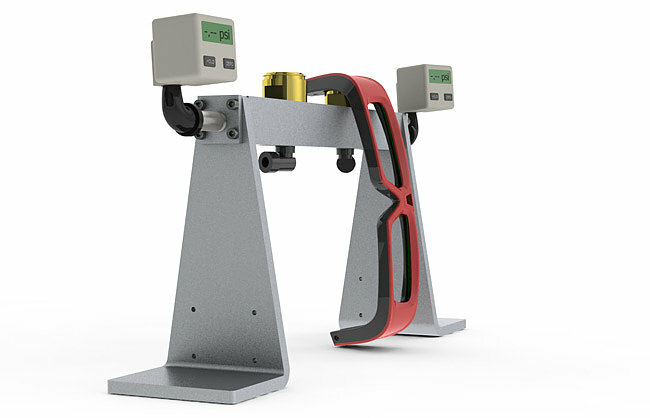 Assembly line workers simply place the glasses onto a custom nozzle and the machine pressure tests the entire assembly and announces whether it is properly sealed or not. 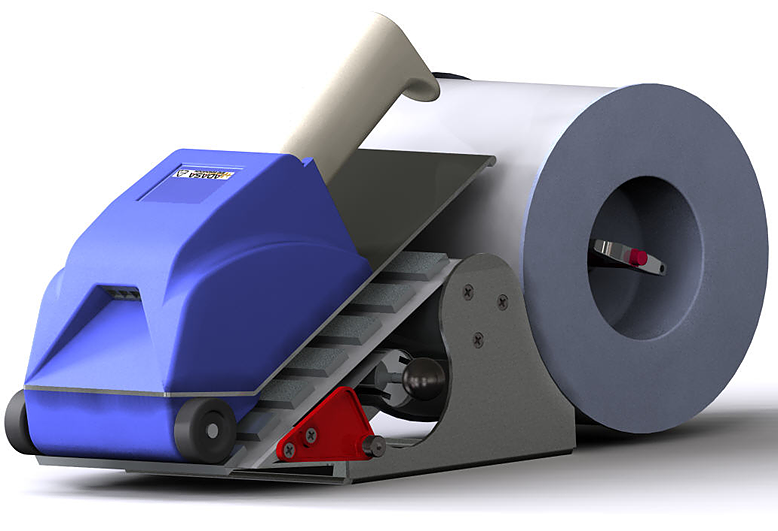 Creating a belt worn wireless printer for warehouses has many challenges. A cartridge system was needed to allow workers to quickly reload the printer when the RFID tags were used up. A low profile motor drive system and spool system ensured the proper tension and positioning to allow tags to be programmed and dispensed. Capacitive touch switches eliminated potential points where dust or water could enter the inner workings.